Karly Hicks, left, of Niceville, Fla., is recognized for her outstanding work on a puzzling medical case and for going the extra mile with her compassion and her investigative and diagnostic skills. 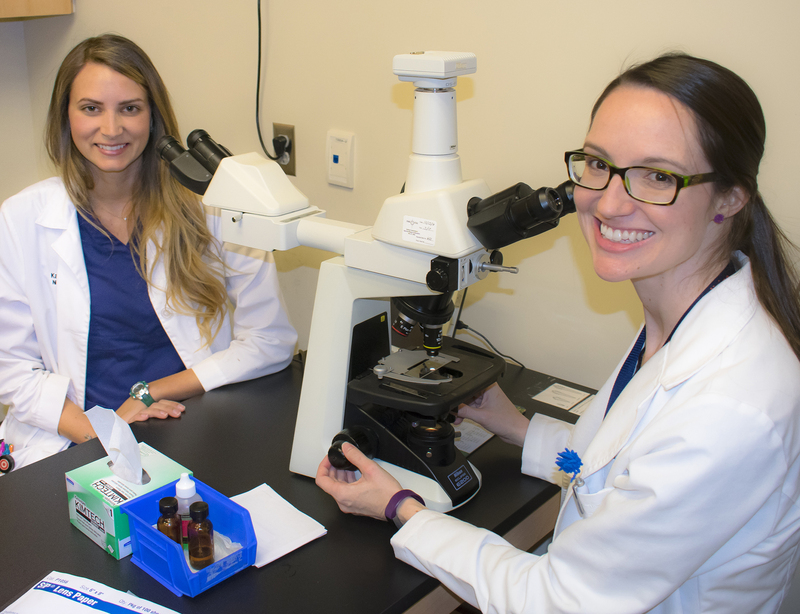 She is shown here with her faculty mentor, Dr. Amelia White, an assistant professor of dermatology in the Department of Clinical Sciences. Often a doctor’s bedside manner is as impactful in a patient’s treatment as the medicine prescribed. This proved true with fourth-year veterinary student Karly Hicks, of Niceville, Fla., and her work on a particularly challenging and puzzling case at Auburn University’s College of Veterinary Medicine. Hicks was recognized in March during the CVM Clinical Student Awards program for her outstanding work on the medical case and for going the extra mile with her compassion, and her investigative and diagnostic skills. Her compassion not only helped calm an anxious pet and its owner, but her initiative also helped diagnose a very puzzling case with excellent progress and recovery resulting. Tiger, a miniature Dachshund, was brought to the Wilford and Kate Bailey Small Animal Teaching Hospital last June by his owner, Patricia Simmons of Columbus, Ga. Tiger was diagnosed as having a reaction to medication administered during routine health care. Dr. White said Tiger’s owner was very anxious. Hicks was on clinical duty that day, and she helped to calm things. Ultimately, Tiger’s condition was diagnosed and a successful treatment program was begun. But that is not the rest of the story. Hicks took a special interest in Ms. Simmons and Tiger’s medical case, Dr. White said. She began researching and spending extra time studying and reviewing Tiger’s case. “Her going that extra mile helped us to solve the medical puzzle and to develop a program of treatment that is proving successful,” Dr. White said. Hicks currently is working with Dr. White to co-author a scientific paper on Tiger’s case. Additionally, Karly presented the findings during her Senior Clinical Pathology Conference (CPC) presentation to the faculty and students of Auburn University College of Veterinary Medicine. Hicks started her preceptorship in March working in her hometown of Niceville. The preceptorship is the on-the-job educational and practice program that veterinary students fulfill just before graduating. Hicks will graduate May 9, and will enter an internship program in Nashville. Her future plans are to pursue a DVM specialty in Dermatology.